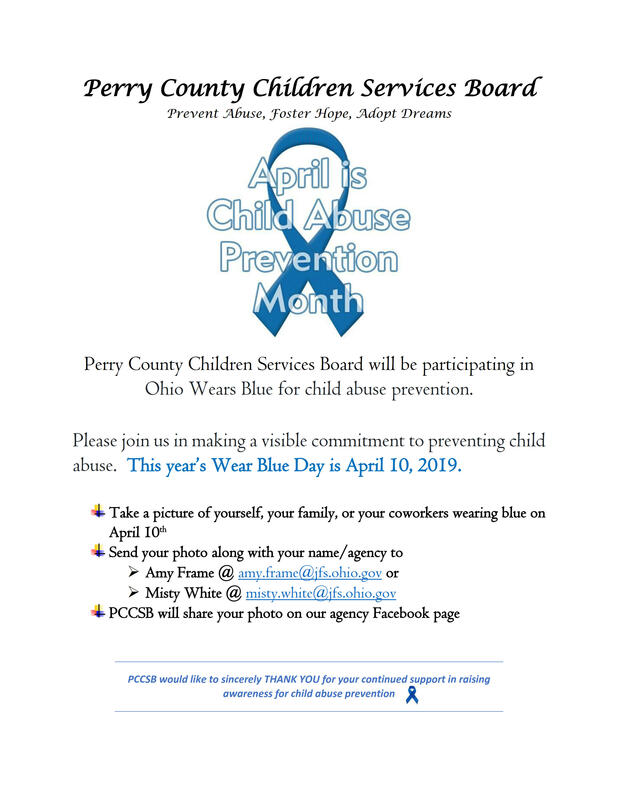 Perry County Ohio Children Services Board will be participating in Ohio Wears Blue for child abuse prevention Wednesday, April 10, 2019. Take a picture of yourself, your family, or your coworkers wearing blue on April 10 and email to amy.frame@jfs.ohio.gov or misty.white@jfs.ohio.gov. Where do I report child abuse or neglect? To report child abuse or neglect call Perry County Ohio Children Services at (740) 342-3836. If you believe a child is in immediate danger call your local law enforcement. Click HERE to see what information is needed to make a report. Click on the photo below to view full size.